Tools, materials, and glass are extra and may be purchased in class. This beginner and intermediate copper foil or lead (your choice) class meets for three weeks, on Saturday mornings 9:30am to 1:30pm. 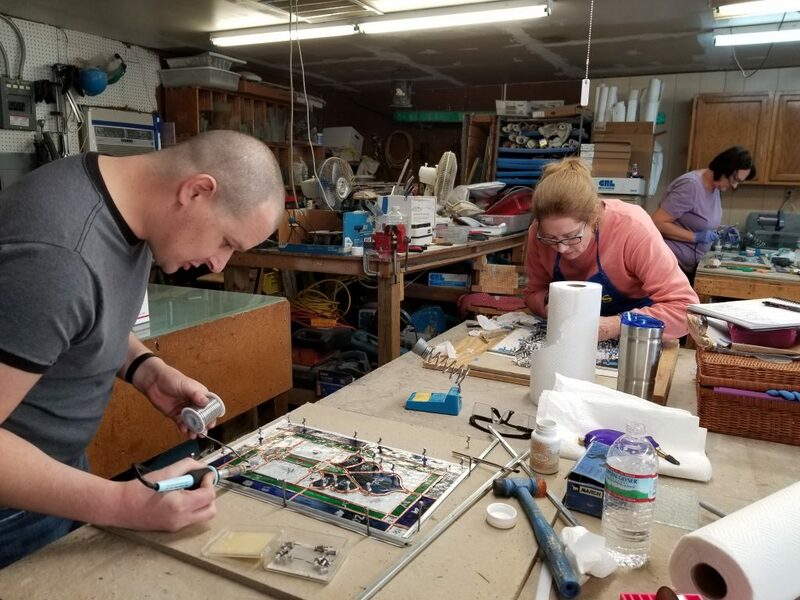 You will create a small panel in this class, as pictured above, then you will have the knowledge and skills to build larger panels if you desire. No experience necessary. This class can also be used to advance your skills or as a refresher or even for studio time. This is a hands on class. Please come in one to two weeks before class starts to register and choose your pattern and glass. You will use your own hand tools (you may purchase any you need in class) beginner kits are available. We have grinders for your use. Completion of your project depends on the detail of the project and time spent outside of class. One project should be completed in class. Please dress very casual, no open toes shoes allowed. We are working with sharp glass! ~ Basic Tool Kit for beginners is…. Call for current pricing. 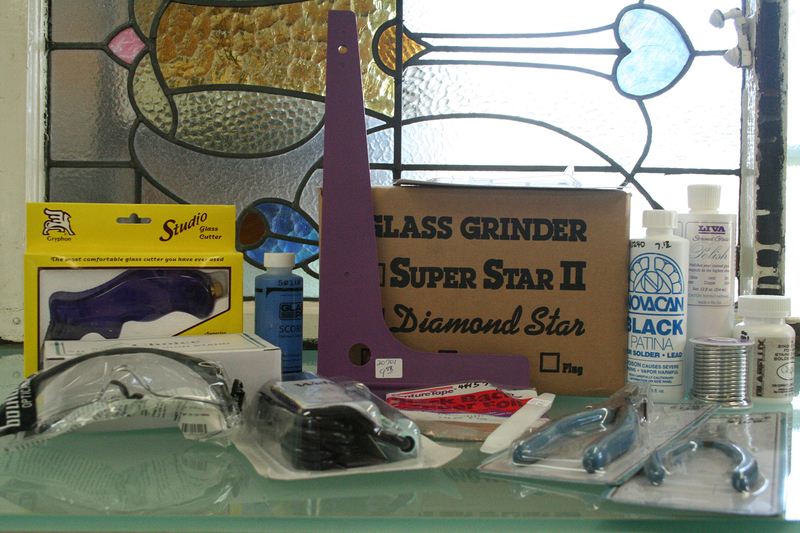 ~ Tool Kit with Glass Star grinder is …. Call for current pricing. 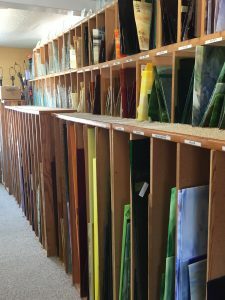 Sheet glass in full sheets from various manufacturers such as Wissmach, Kokomo, Bullseye, GNA, Oceanside, Youghiogheny, and others suitable for traditional stained glass work as well as architectural installation. We will cut to custom sizes for cabinet glass and other uses. Large selection of mouthblown glass at extremely low prices as well as an older stock of Spectrum glass – while supplies last! Tools, solder, chemicals, brushes, putty, Weller soldering irons, replacement tips and parts. Venture foil in standard, silver-backed, black-backed. A large selection of lead and zinc profiles. We also carry Glastar grinders and Toyo cutters. Contact Stained Glass Unlimited today for custom stained beveled and etched glass windows, door glass and more!